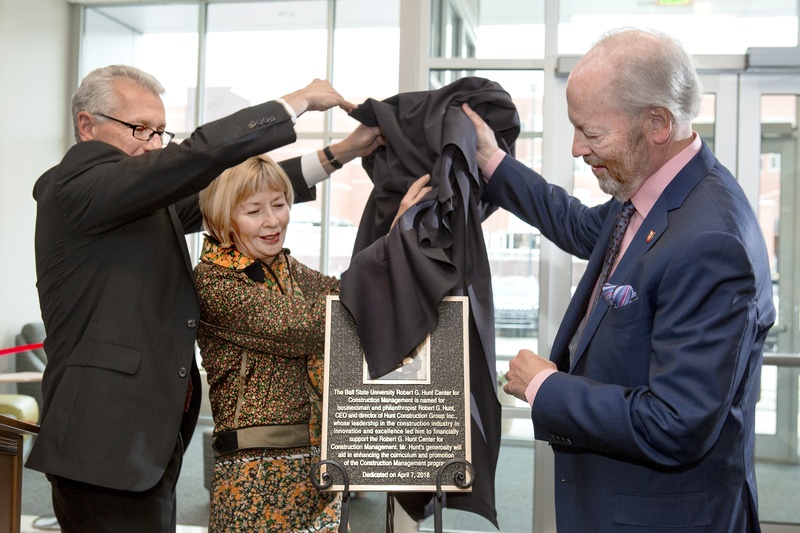 Terry King (left), Ball State's acting president, assists Diane and Robert G. Hunt with the unveiling of a plaque recognizing the couple's support of the university and its construction management program. MUNCIE, Ind. -- Ball State has created a center to prepare its students for the rapidly expanding construction management field in hopes to increase the amount of highly skilled managers. The 2,500 sq. ft. facility is designed to foster teamwork. “Now more than ever, students must work collaboratively as part of highly complex teams,” said James Jones, a construction management professor at the university. “Our students are learning the skills needed to become proficient managers who can guide multimillion-dollar projects from concept to completion on time and within budget. The facility’s primary use will be for the program’s capstone course, which focuses on students working in four-member teams on a construction project. Each team will have its own physical office space for the duration of the course. Students will have around-the-clock access to the center to work on assignments. Jones noted the facility’s layout is based on current collaborative spaces at Hunt Construction Group offices in Indianapolis and other cities across the nation. The center’s name honors the program’s strongest supporters, Diane and Robert G. Hunt. Robert Hunt has been an executive-in-residence for two immersive learning projects at Ball State: the first, in 2010, focused on redesigning a transportation hub in Venice, Italy, and the second, in 2012, had students evaluate Hunt Construction Group’s brand image and develop a strategic brand image management plan.